The Netgear AC1200 Wireless WiFi Range Extender (EX6200) is a mid-range option that strikes a perfect balance between price and features, making it suitable for most users. If you're looking for a device with a bit more flair and features than your run-of-the-mill WiFi extender, the Netgear EX6200 is an excellent choice. The EX6200 doesn't have all the bells-and-whistles of the top-of-the-line models, but for with its profusion of Ethernet ports, support for MU-MIMO, and beam-forming, it’s more than enough to handle the needs of a household. We spent a week testing it, evaluating the design, ease of setup, network performance, and software. 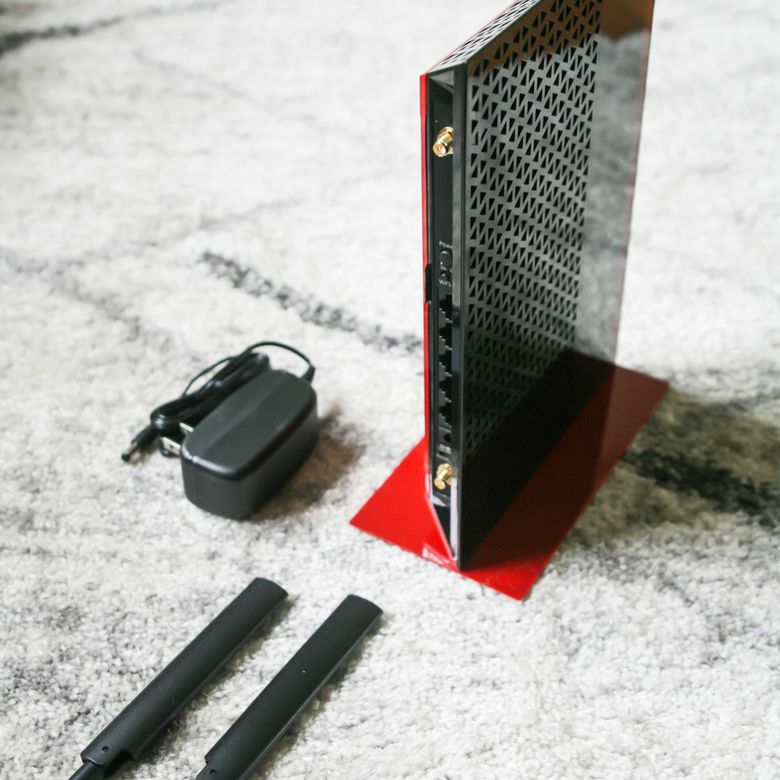 The red-and-black color scheme of the EX6200 makes it look more like something out of Netgear's Nighthawk line rather than their standard series of extenders. It has a more premium feel than most extenders, and it's refreshing compared to the boring white plug-in boxes that house the majority of its peers. One of the most noticeable things about the EX6200 is that it's big. Not in a bad way, but it's definitely an atypical extender design. It can either lay flat, or you can use the included stand to install it vertically. We preferred using the stand since it's very slim and takes up very little space in this configuration. We also loved the fact that the EX6200 uses a separate AC adapter and cord to supply its power. Other extenders that plug into a socket limit the areas you can deploy them, take up a wall plug, and just are usually an eyesore. On the other hand, the EX6200 is a very attractive piece of equipment that looks sharp sitting on a desk. Also, if you just don't want to show, since it uses a cord you have the freedom to tuck it somewhere out of sight easily. One of the best aspects of the EX6200's design and something that sets it apart from the competition is its five Gigabit Ethernet ports. These are immensely useful for anyone who wants to hardwire game consoles, PCs, smart TVs, set-top boxes and other devices, but don't have the option to run an Ethernet cord to them. For example, our router sits in the living room entertainment center against one wall. On the opposite side of the wall sits an entertainment center in our bedroom. Now, we could run an Ethernet cord around the wall, through the bedroom door, and to the entertainment center, which would be around 60 feet or so, or we could drill through the wall and install an Ethernet socket. However, with the EX6200 we didn’t have to do either. Since it's right on the other side of the wall, we can set up the EX6200 and get the full signal to hardwire our TV, PS4, and Xbox One, which gives better speed and reliability than if we used them with WiFi-only. Getting the EX6200 up and running is the same process used with pretty much every wireless extender on the market. Pull the thing out of the box, plug it in within 10-15 feet of your Wi-Fi router, and hit the WPS button. Then head over to your router and hit the corresponding WPS button on it. Voila! You're good to go. Alternatively, you can either plug into one of the Ethernet ports, or connect via the temporary network the EX6200 creates when you first turn it on. Check the manual for the web address to access the extender's interface (www.mynetext.net), and the bottom of the router for the default username and password (change this immediately), log in and follow the wizard that loads to get connected. Once you've got that taken care of, you'll have to find the best place for your extender's new home. If you're trying to improve the signal or hardwire something 25 feet away from your router or less, just plop it down in the area and you should be good to go. For further distances, you'll need to use a bit more finesse. Place the extender halfway between the router and the area you're trying to extend your Wi-Fi. Then you can check the light on top that shows the status of the connection between the extender and the router. Red is bad, yellow is mediocre, and green is good. If you've got a green, head over to the previously dead Wi-Fi area and check your network. If you've followed the above steps and your Wi-Fi connection is strong, you're good-to-go and you can start living your life with the Wi-Fi coverage you always knew you deserved. Otherwise, you'll have to shuffle the extender either closer to the dead zone or closer to the router until you find the sweet spot. The Netgear EX6200 doesn't require any special software installation. If you need to access the interface, you just need to be connected to it in some manner, either through Wi-Fi or Ethernet, and you can open the control panel in a browser. You can access the extender by either using the local address (www.mywifiext.net) or via the device's IP. The interface isn't fancy, but it's easy to use. If you haven't connected the extender to a network yet, there'll be a wizard you can use to do so. You can also do things like set a static address, allow or disallow devices, and check out some statistics concerning your extender. All-in-all, the Netgear Genie software isn't going to blow your mind, but it's straightforward, and since most network configuration settings are done at the router, you don't need a ton of options. The Netgear AC1200 Wireless WiFi Range Extender (EX6200) has dual-band Wi-Fi, boasting two antennas. It transmits and receives on the 2.4GHz and 5GHz bands and is compatible with Wi-Fi b/g/n/ac devices. The EX6200 is pretty run-of-the-mill when it comes to wireless connectivity, and its AC1200 rating (300Mbps+900Mbps) puts it roughly in the mid-range category. It's not a speed demon, but it's more than adequate for most applications. You won't find high-end features like a dedicated backhaul channel with the EX6200, but it does have Multi-User MIMO technology onboard which can help with network congestion when used with compatible devices. It also uses beamforming which claims to adjust each signal based on the device connected, so each user gets the optimal experience. The Netgear AC1200 Wireless WiFi Range Extender (EX6200) is an excellent product, with plenty of features for the price. Where the EX6200 really stands out is the five Gigabit Ethernet connections available on the unit. These are a huge deal if you want to hardwire devices in areas without Ethernet access. It spares you from having to run long, unsightly Ethernet cords or needing to buy an Ethernet switch in addition to an extender. The EX6200 also has a USB 3.0 port which can be used for network-attached storage or other applications. Given that a lot of extenders forgo a USB port, it was nice to see this included. If you have a wired connection to the internet, but no spare router, you can use the EX6200 in Access Point mode and it'll allow you to connect via Wi-Fi. However, unlike a router, it doesn't have a built-in DHCP server (Dynamic Host Configuration Protocol which provides an IP address) so you'll still need a device that can handle that task somewhere in your network. Again, the EX6200 is a mid-range unit with a great design and a few bonuses, so don't buy it thinking you're going to get high-end performance. We found the unit performed adequately, but didn't exceed expectations. Most of the time, the EX6200 hovered around 500 to 700 Mbps up to the 50 feet mark. By the time we had reached 75 feet that speed had more than halved to 200-250 Mbps. At 85-90 feet the speed had dropped to 50 to 70 Mbps and we started experiencing intermittent disconnects. If you're looking for a device with a bit more flair and features than your run-of-the-mill Wi-Fi extender, the Netgear EX6200 is an excellent choice. From our testing, we'd say the sweet spot for the EX6200 is 50 feet or less. Your results, of course, may vary depending on how many walls you place between yourself and the device and their composition. One area we did find the EX6200 excelled in is verticality. It seems like a lot of plug-in models have their range dramatically affected by height, but the EX6200 transmitted to the second floor into a room around 40 feet away in a straight line and we saw speeds around 300 to 350 Mbps. At $99.99 (MSRP) the EX6200 isn't exactly cheap. You can get extenders for $30 or lower that get the job done, but that's all they'll do. We found that the EX6200 struck a good balance between price and features, and is an excellent extender for most use cases. The EX6200 doesn't feature any mesh networking capabilities or a dedicated backhaul channel, so if you're wanting to deploy multiple extenders or plan on having heavy traffic, you might want to look at a higher-end model or opt for a mesh setup like Google WiFi (MSRP $299). Though it comes at a much steeper price, it would allow you to cover a wider area through multiple units. On the flip side, you may find that the EX6200 is too feature-rich for what you need. While the five Ethernet ports are great, if you just need to get your internet through a wall, a cheaper extender with one Ethernet port—like the $30 Netgear EX3700—will set you back less than half of what the EX6200 costs. See more reviews of our favorite Wi-Fi extenders. If you're in the market for an extender, the EX6200 is one of our favorites. It doesn't excel in any category, but it does everything it’s designed to do well. Product Dimensions 9.92 x 6.85 x 1.22 in.